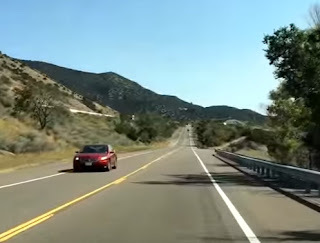 Just east of Albuquerque and near the village of Tijeras, New Mexico, there lies a length of Route 66 that has a series of grooves cut into it (also known as a rumble strip) and if you drive over them at exactly 45 MPH, the sound of your vibrating tires will play a portion of "America the Beautiful"! Apparently, this was a project that the National Geographic Society worked on in conjunction with the New Mexico Department of Transportation for a series they were doing called "Crowd Control" and the purpose of it was to develop a way to encourage drivers to slow down. In this short video, you'll get to see Cindy and I drive over this Musical Road in our Jeep Renegade and you'll get to hear the tune being played.